Alex's Weblog: Do you really see the reality? Like most software engineers, I don't really do enough exercises in my daily lives. So, I force myself to take a 30-minute walk on the UCLA campus every day after lunch. After taking a few walks, I start to realize that the UCLA campus is actually pretty beautiful. 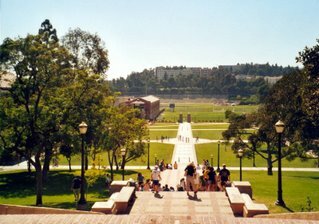 The most beautiful part of the campus is the area from Wilson Plaza, up the Janss Steps all the way to Dickson Court. 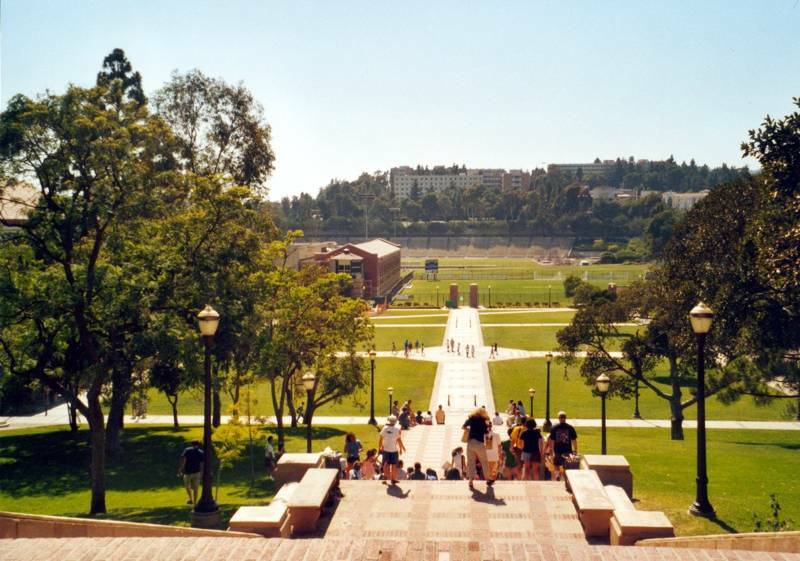 "How come I never realize there is such a beautiful place at UCLA before?" I thought to myself. I spent around four years at UCLA to get my degrees. During that period, I'm pretty sure that I've walked by that area a few hundreds times. However, not a single time did I have this feeling. As an engineering student, my life was just about going to classes, taking notes, looking for a good library to study, doing homework, studying in groups, etc. Wilson Plaza was just part of my way to go to north campus from Boelter Hall. One thing I notice from my lunch walk is that I walk slower than almost any student, including those who are shorter than me. Since my legs are longer than theirs, they must be walking at a faster pace in order to get ahead of me. Our minds play a big role in how we perceive the world. In the book Sophie's World, I remember Alberto told Sophie that when a person looks for a friend in a restaurant and that friend hasn't arrived yet, what he actually sees is "Oh, my friend isn't there". He doesn't really "see" the waiters and other customers. He sees something that doesn't exist! Talking in a philosophical way (don't yawn yet), we never really know the reality. Except the moment right after we were born, every one has some kind of memory and experience. Our memory, experience, emotions all influence how the world appears to us. Because of that, there are so many misunderstandings among people. To Peter, this McDonald's at the corner of the intersection is just a place where he has lunch at when his wife doesn't have time to prepare food for him. He would rush to finish the combo meal so that he has time to take a 15 minute nap before getting back to work. He can barely remember the faces of the cashiers there, thought he sees them every week. To Mary, this McDonald's is the place where she always hanged out at with her boyfriend in her high school junior year. Now, as a successful lawyer, she doesn't really go to any fast food restaurant anymore, but she can't help smiling when she recalls that her ex-boyfriend always asked for three creamers for her coffee, which was exactly how much she wanted. To John, this McDonald's is the first time he had a birthday party in a restaurant. His dad was awful at singing but he sang "Happy Birthday" to him in such a loud voice that every other customer could hear it. The customers were laughing at his dad while he broke into tears. His dad passed away three years ago. However, that day was like yesterday when he visits this McDonald's again. Next time you have an argument with your beloved one, your family or your friends, try to put yourself into their shoes. When you do that, you may start to find out why their reactions to certain thing are so irrational. You may start to understand why they made such a stupid decision, to your mind.